When you browse our inventory you will be taken to the GoAntiques website, our e-commerce partner. The links to the left and below will take you to works in the categories indicated. You may also search there by price range, subject, key word, etc. Our exhibition program has ended and we are now open by appointment only. ROBERT TAT GALLERY located in San Francisco, California is now open by appointment only. To visit us and view photographs, please email info@roberttat.com or call 415-781-1122. The ROBERT TAT GALLERY specializes in 20th century European and American photographs. Our eclectic collection of vintage and later prints emphasizes Photographic Modernism, but also includes earlier and later photographs. The gallery shows works by 20th century master photographers, lesser-known mid-century photographers, the Pictorialists, select contemporary artists, as well as unique vernacular and anonymous photographs and selected 19th century works. We also maintain a good selection of vintage historical photographs of San Francisco and California. To be on our mailing list and receive periodic updates when new material is posted on this site, please send us an email with your name, phone, and photogarphic interests. We are always looking for fine photographs to purchase or consign. If you have photographs you would like to sell, please contact us. If you are looking for a particular photographic image, works by a specific photographer or a certain style of photograph, please contact us with your request. If we don't have it in inventory we'll be pleased to search for you. We have resources for photographic material all over the world. What is a Salon photograph? Numerous camera clubs around the world sponsor regular exhibitions, called salons, where members of other clubs compete to show work. The salons during the first half of the 20th century were particularly rich, featuring the work of many artists who later became famous. We take a special interest in the the works of lesser known salon photographers, often serious amateurs or commercial professionals doing their own work on the side. Their photographs are frequently beautifully composed and crafted, with an aesthetic and print quality rivaling that of the celebrated artists of the day. Many collectors appreciate salon work for these reasons -- and because it is more reasonably priced than works by better known artists. Salon prints may bear exhibition labels or stamps on the reverse of the photograph's mount, indicating awards or other participation in various salons. What is a Vernacular photograph? The term "vernacular" literally means "of the commonplace." In photography collecting, it refers to photographs which were made without artistic intent. This includes commercial photographs, personal snapshots and albums, historical images, scientific photographs, etc. Many collectors find vernacular images interesting, both for subject matter and for the occasional image that has an aesthetic appeal, albeit unintentional. What is a Found Image? Our Found Images are specially selected snapshots screened with the same criteria as a fine art photograph: artistic appeal, engaging or emotional subject matter, and print quality. We search through about 1000 pieces to find one "gem in the rough" that meets our standards. There is growing interest in collecting snapshots and a new appreciation of them as art, with several fine arts museums mounting exhibitions during the past few years. 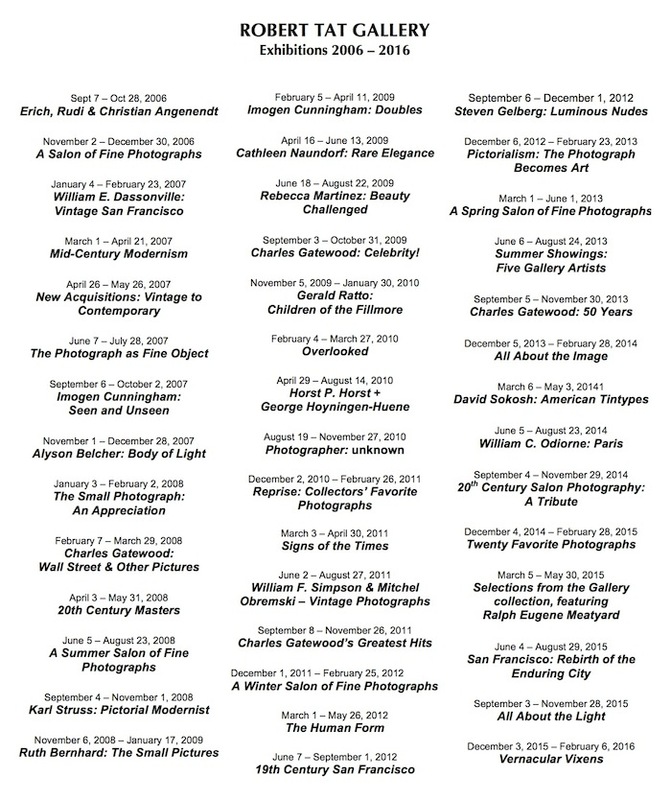 Found Images from Robert Tat's collection were exhibited at the San Francisco Museum of Modern Art in 1998 as part of their "Snapshots: The Photography of Everyday Life" show.